Anatoliki s.a. acts as a Center for the Development of Human Resource and the Strengthening of the Local Economy in the wider area of Thessaloniki. The Local Authorities of the peripheral units of Thessaloniki and Halkidiki comprising the shareholders of Anatoliki s.a. have decided to implement a strategy aiming to transform the region into a green zone, with respect to other similar international initiatives. Anatoliki s.a. is the tool for a more rapid and comprehensive approach towards this goal. The basic operating strategy is to acquire knowledge and expertise through participation in EU-funded projects and to function as a multiplier of those in the national, regional and local context. Anatoliki s.a. has extensive experience in water management, as it has implemented relevant projects (e.g. 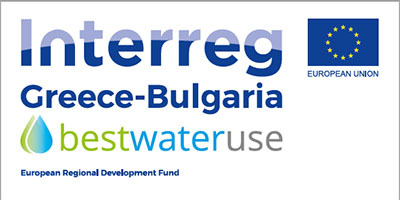 LIFE WATER AGENDA, WATER in COREMED) as the Coordinating Beneficiary. Moreover, Anatoliki s.a. has long experience in developing educational material and also implementing educational programs offered to pupils of primary and secondary schools, targeting ages between 4-17 years old. Economic Development Agency Bansko is a nongovernment organization which objectives through dialogue and implementation of joint activities between local governments, the private sector and NGOs to contribute to economic and social development of the region of Bansko. Our mission is to support local administration, private sector and other interested parties in the formulation and implementation of strategies, policies and programs for economic and social development of the region. To achieve its goals, EDA Bansko perform activities not only in the municipality of Bansko, but also in the Blagoevgrad region in search of partnership development in the region as a whole. EDA Bansko has a highly qualified team with expertise in the field of economic development, finance, social and educational activities, as well as experts in the field of project management. Experts of EDA Bansko (broadcast by the members) have a key part in the development of strategic municipal documents, analyzes and studies as: “Operational Program of Municipality of Bansko 2007 – 2013”, “Marketing strategy for the region of Bansko as an European center for winter tourism”, etc. The Association Eco Nevrokop is a non-governmental organization, founded in 2009, aimed at developing projects for the protection of the environment, the education and integration of kids and young people, the combation of discrimination, the promotion of equality, the support of tourism, as also of the economic and environmental activities in the region. The association is addressed to the residents and the stakeholders, while undertake and implement projects, in order to enhance the natural landscape, manage the natural resources and organizing events and workshops to disseminate environmental awareness. One latest action of ECO Nevrokop was a campaign to improve the knowledge for healthy food in high schools students. Aneser s.a. was founded in December 1994, aiming at the participation to the European Initiative LEADER II. Its main shareholders are the local administration organizations of Serres Prefecture, the Region of Central Macedonia, the Regional Association of Municipalities of Central Macedonia and some others. Its mission is the implementation of national and EU programs, as well as of every other initiative that enhances the local development of the Prefecture of Serres. Economic Development Agency High West Rodhopi is a nongovernment organization with expertise in the field of water management, local SME support and education activities. The main goal of the organization is through development and implementation of specific EU projects to support local business development with specific focus in tourism and agriculture, environment protection and establishment of efficient and stable partnership between local public authorities, private sector and society.